(No. 10), Green Curry (No. 19), Thai Fried Rice (No. 24) and Moo Nam Tok (No. 36)—thanks to characteristic flavours and rich taste of each dish that have delighted locals and visiting bon vivants from across the world. Ratchaprasong’s ever-growing strengths as a premier business and lifestyle district have earned it the status as “The Heart of Bangkok”. Specially with Ratchaprasong Walk or “R-Walk”, a four-direction interconnected skywalk, being fully opened, it gives visitors the walkability to seamlessly connect all lifestyle experiences across EAT-PRAY-STAY-SHOP interests, especially dining experience. Ratchaprasong is recognised as an area of delicious food. To please diners from across the world with delightful flavours and aesthetics, Ratchaprasong today would like to present Taste of Ratchaprasong with eight signature Thai dishes contributed by in-hotel restaurants across the district under a creative culinary concept of Thai Taste With A Modern Touch. Chef Fae Rungthiwa Chummongkhon, Chef de Cuisine of Front Room whose have had more than ten years of experience in the culinary scene, was inspired by Thai stir-fried crab with curry powder and since seafood is one of Thailand’s most popular food ingredients, chef has paired crab with celery root from the Royal Project, which is a popular ingredient in Scandinavia, to create Blue of the Sea as a Thai dish with Nordic touch. 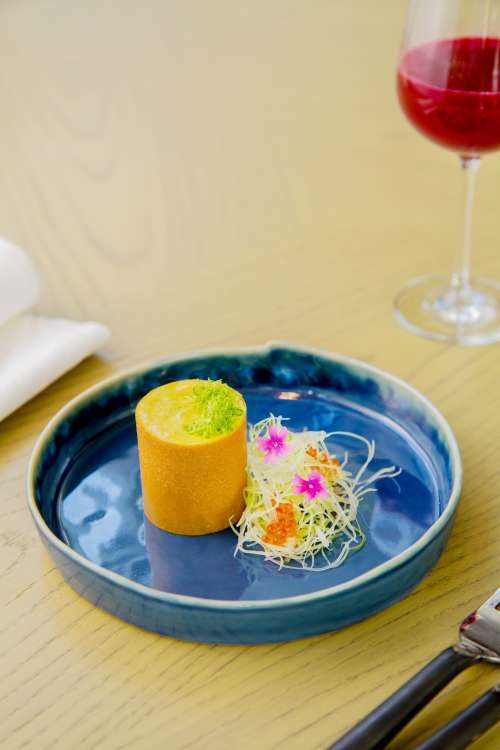 Stir-fried curried crab is innovatively presented with modern visual appeal in a cylindrical inset sprinkled on top with celery, plus more celery on the side together with salmon roe and vivid adornment of purplish verbena flower. 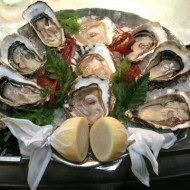 Blue of the Sea has a rich and well-balanced taste. It pairs perfectly with beetroot juice that contains beetroot, pineapple and jicama, which nicely enhances aroma and flavour of the already superb dish. 5:30pm to 10:30pm. For further details, please call 02-846-8888. An innovative dish that fully embodies traditional characteristics of Thai cuisine, Seared Tuna Tom Yum Soup with Tamarind Sauce features ingredients that are unmistakably Thai including tamarind sauce as well as homemade tom yum seasoning made from kaffir lime leaf, galangal, lemongrass and cayenne pepper. Many of these vegetables are sourced from the Royal Project. Tuna is marinated in tom yum seasoning and then cooked with tamarind sauce, resulting in a modern, tasty Thai dish with just right degree of seasoning. 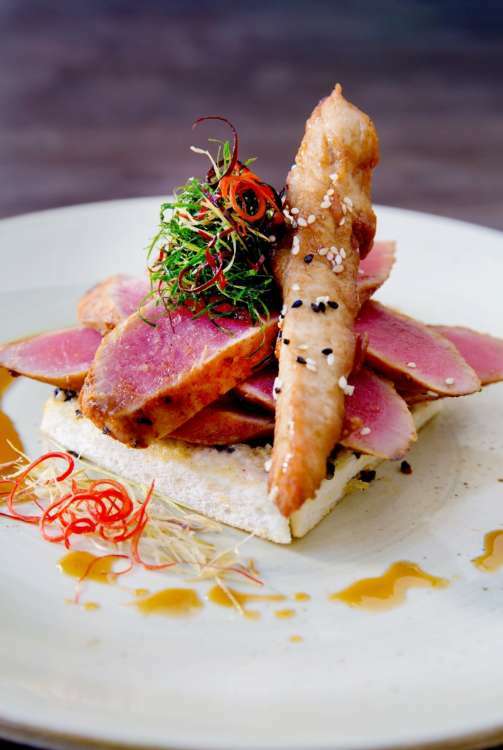 In the dish, seared fillet of tuna is stylishly presented on shrimp toast and pork shoulder and dressed with BAR9’s special tamarind sauce. BAR9 Beer Garden is supervised by Chef Sompong Wisungray, an award-winning chef who has more than eleven years of extensive experiences in Thai and European cuisines, plus special expertise in applied and creative cooking. Location: BAR9 Beer Garden, 9th Floor, Novotel Bangkok Platinum Pratunam. It is opened daily from 8:00am to 1:00am. For further details, please call 02-209-1700 ext. 8705. 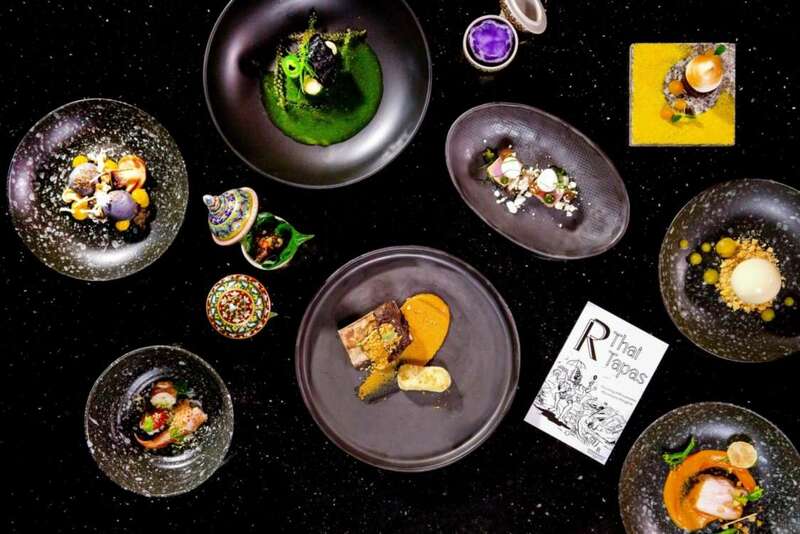 Multi-award-winning chef Prasertchai Trongvanichnam is celebrated for his creative take on Thai food using molecular gastronomy approach—a cooking style involving scientific disciplines. 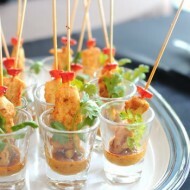 This Thai Tapas set was inspired by the multitude of Thai ingredients and the possibility that they have to offer. Chef Prasertchai thus reinvented tapas by infusing them with Thai culinary expression, using Thai herbs like bird’s chilli, tamarind, lemongrass and kaffir lime as key ingredients to bring out characteristic flavours of traditional Thai food. The result is a set menu that perfectly fuses classic and modern appeals—one that makes a departure from conventional expectations and tempts diners to tease their palate with novelty in food. Highlight of the set is beef massaman curry which is a combination of 24-hour sous-vided Australian beef from cage-free oxen and creamy, molecularly-cooked massaman curry which retains authenticity of this famous curry as well as beef’s juiciness. The veteran chef applied scientific knowledge in molecular gastronomy and visually presents these Thai tapas with unusual imagination to give an added sense of novelty, excitement, curiosity and modernity. A refreshing welcome cocktail drink is included as a special overture to this set menu. Location: R Bar, Lobby, Renaissance Bangkok Ratchaprasong Hotel. It is opened daily from 7:00am to 1:00am (the Thai Tapas set menu is served on Thursday, Friday and Saturday evenings from 7:00pm to 9:00pm. Welcome cocktail drinks are served at 6:30pm). For further details, please call 02-125-5105. Yum Dok Khajorn Bua Luang is unique for its combination of ingredients: petal of multi-petal pink lotus that tastes slightly bitter is paired with mildly sweet milkweed flower alongside with a few other healthy ingredients—toasted coconut, roasted ground peanut and boiled lotus seeds. The dish is served with a sweet, sour and spicy salad dressing prepared by simmering the mixture of coconut milk chilli paste, tamarind juice, palm sugar and salt. In terms of plating, bite-size amounts of milkweed flower salad are placed on lotus petals, which also creates a beautiful colour contrast between the two elements. The dish pairs perfectly with bale fruit and pandan leaf tea that has an especially sweet aroma. Erawan Tea Room is supervised by Chef Songpol Kittikhunwatchana, an alumnus of the prestigious Le Cordon Bleu Thailand who have years of professional experience in food service. 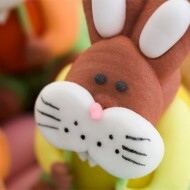 Location: Erawan Tea Room by Grand Hyatt Erawan Bangkok, 2nd Floor, Erawan Bangkok. It is opened daily from 10:00am to 10:00pm. For further details, please call 02-254-6250. Goong Kua Prig Gleur is a signature dish noted for its firm, crunchy flesh of sizable tiger prawns as well as crisp bites of deep-fried Thai herbs and spiciness of a curry paste concocted from garlic, chilli, galangal, lemongrass and bell pepper creating Thai herbs are used not only for their distinctive aromas, but also their health benefits. Adding to delightful flavours, diners will also appreciate visual aesthetics of food plating and presentation, which is characterised by novelty and a touch of modernity. Spice Market is under supervision of Chef Warinthorn Sumrithphon, a graduate in culinary arts and restaurant management from Dusit Thani College who have extensive experiences working in numerous four- and five-star hotels. With his passion for cooking, Chef Lak Preeprem thrives as an engineer-turned-food professional. His reinterpretation of Tom Yum Goong brings a breath of fresh air to this iconic Thai dish by giving it a true sense of premium quality. 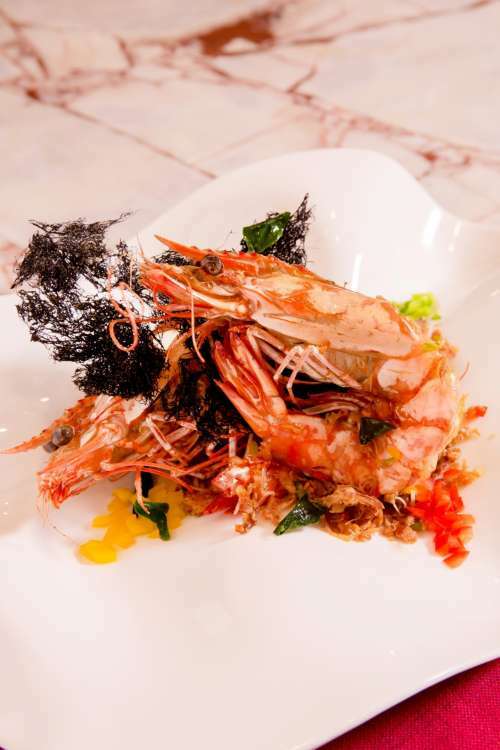 The dish highlights fresh, bouncy and sweet meat of large-size spiny lobsters harvested from Phuket sea, where the lobsters have thinner carapace and more generous amount of meat. His combination of tom yum soup, the lobster meat, tamarind leaf and freshly-squeezed lemon juice gives the dish a very well-balanced flavour overall and just the right degree of spiciness, plus health benefits of tamarind leaf. 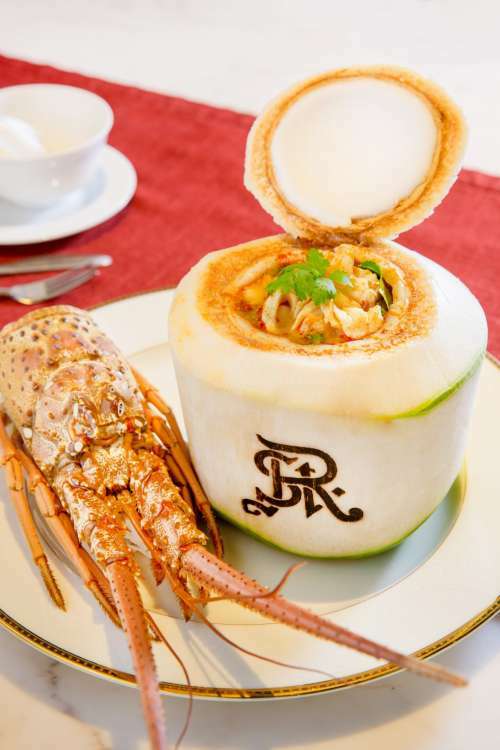 Tom Yum Goong Mungkorn is stylishly served in a coconut-shell bowl, which also adds to the soup an appetising aroma of coconut along with beautiful decoration of lobster carapace on the plate. 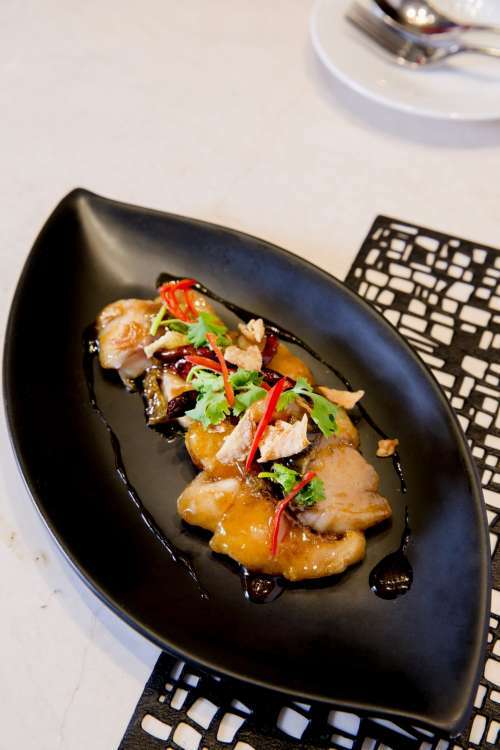 Sea Bass with Tamarind Sauce is a signature dish at the Espresso. Deep-fried sea bass is dressed with a special tamarind sauce that combines Thai herbs and ingredients—including ripe tamarind, lemon, bell pepper, dried chilli and coriander—with fish sauce and palm sugar as key seasoning ingredients. The result is a perfect match of flavours between mellow taste of the sea bass and sweet-and-sour taste of the tamarind sauce. 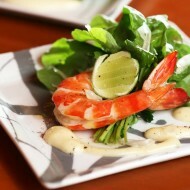 The Espresso is an international buffet restaurant with a diverse array of food. Besides Sea Bass with Tamarind Sauce, other menu highlights are Tom Saeb Kradook Mu On, Yum Sam Krob and fresh seafood dishes including New Zealand mussel, lobster, Fine de Claire oyster and Alaskan king crab, etc. The restaurant is supervised by Chef Rolando Manesco, who has many years of kitchen management and restaurant service experiences across Asia and Europe. Location: Espresso, M Level, InterContinental Bangkok. It is opened daily from 6:00am to 11:00pm daily. For further details, please call 02-656-0444 ext. 6430. 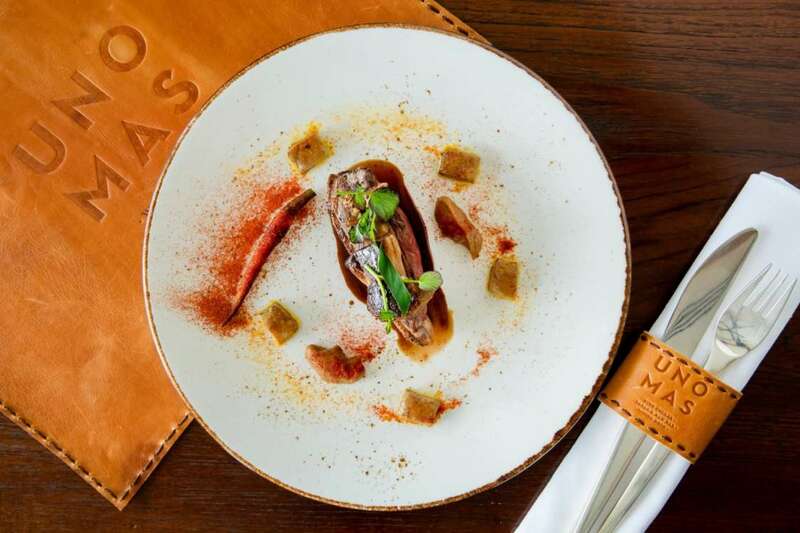 Seared Duck Breast Served with Foie Gras that fuses Spanish tastes with Thai cuisine was crafted by Chef Sandro Aguilera, who has more than 22 years of culinary experiences, including in Michelin-starred hotels in France and Spain. To present a local ingredient that boasts world-class quality, the duck breast used is sourced from the Royal Project due to its excellent firmness and pleasing taste. This duck breast is cooked with foie gras and served with a special sauce prepared from duck bone stock that has been simmered for several hours and seasoned by Spanish spices and ingredients to enrich the taste and aroma, especially mustard sauce and condiments. 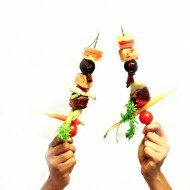 The sauce is a special recipe created by UNO MAS chef. Plating is also done in Spanish style with a unique, modern touch of UNO MAS. 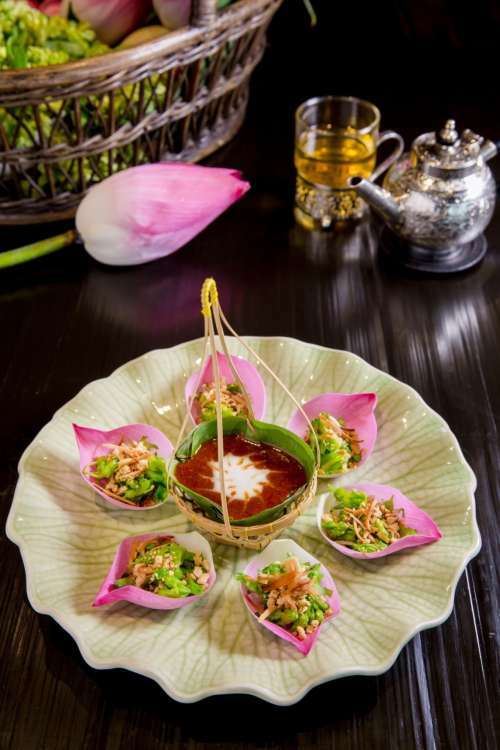 Experiences and exacting standards of their creators combined with the finest ingredients and creative plating ideas, all these signature dishes are bringing a magic spell of Thai flavours and novelty to epicures, Thai and foreigners alike. Discover Taste of Ratchaprasong under the concept Thai Taste With A Modern Touch today in the heart of Bangkok at Ratchaprasong.